The Optima CRS program is a straight forword, easy to use central reservations system ideal to small and medium hotel chains that do not wish to invest in large, complicated and expensive central reservation systems. Optima CRS allows the user to view the occupancy of all or part of the hotels at one glance and access each and every hotel easily. It allows creating FIT reservations, group reservations and price quotations based on the hotels' information. 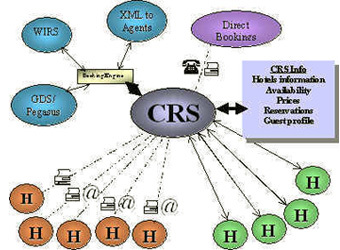 Availability of the hotels can be set as allocation given to the CRS or real time availability seamlessly taken from the actual hotel database. The Optima CRS provides an integrated platform for inventory distribution and reservation processing worldwide. As an ASP based program, the Optima CRS system saves the time and investment necessary to continually update the client’s system. As one of the most advanced reservation systems available, the implementation of Optima CRS offers clients a significant strategic advantage over competitors through higher performance and state-of-the-art data processing. The Optima Central Reservations System offers Seamless Integration from CRS to all GDS systems (via Switch), giving travel agents real time availability information for participating hotels. Whether you are searching for a complete outsourced CRS solution, or ‘state-of-the-art’ customised solution to your CRS,Optima CRS is your answer. Optima CRS is just one of a range of integrated products and services available from Silverbyte in the Optima Line of Hotel Management software, all built to integrate with each other for smooth operations and all running on ASP platform allowing simple operations on a multi-level, sophisticated, integrated system.